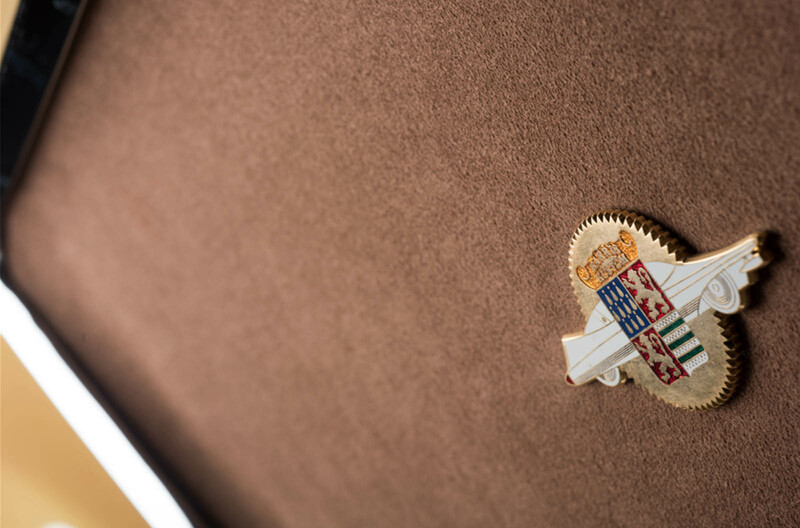 Missed the chance to bid on Atkinson’s McLaren F1? 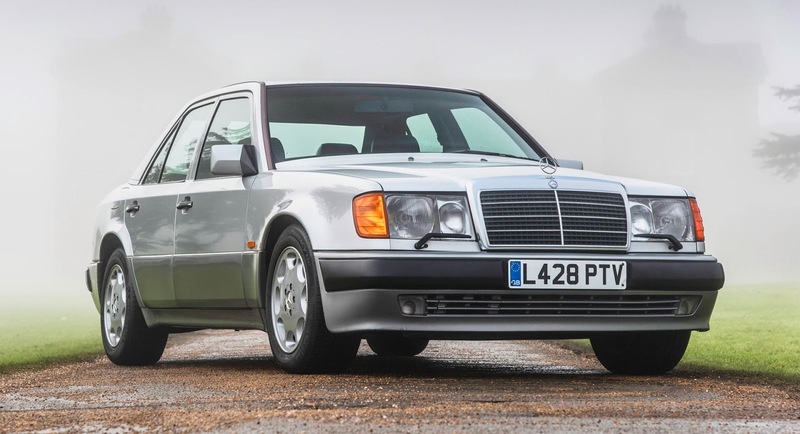 Don’t worry as the famous actor is auctioning two more cars from his personal collection, including a 1993 Mercedes 500E and a 1989 Lancia Thema. 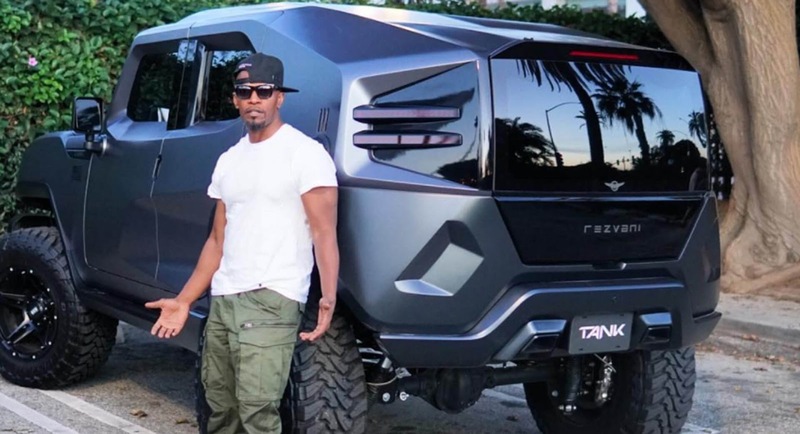 The crazy Rezvani Tank was only unveiled in October and it appears as though actor and singer Jamie Foxx has just taken delivery of one of the very first production examples. 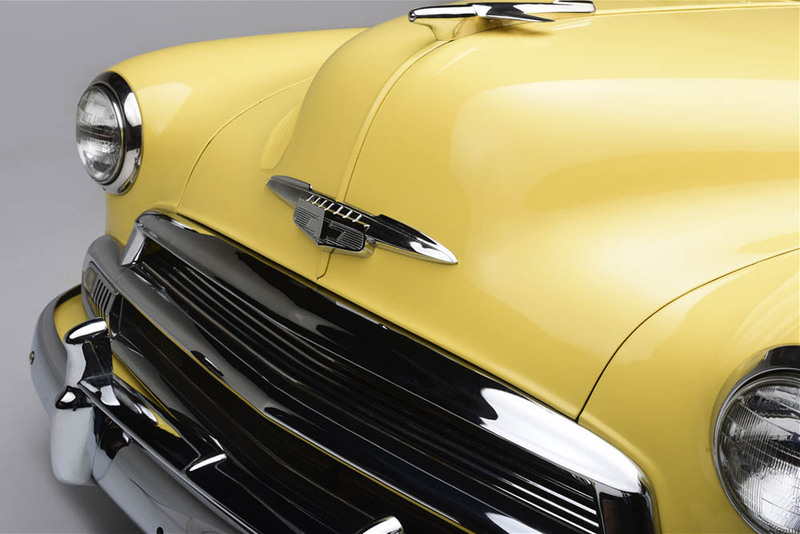 As much a car guy as he was an actor, McQueen amassed an enviable collection of cars and motorcycles. 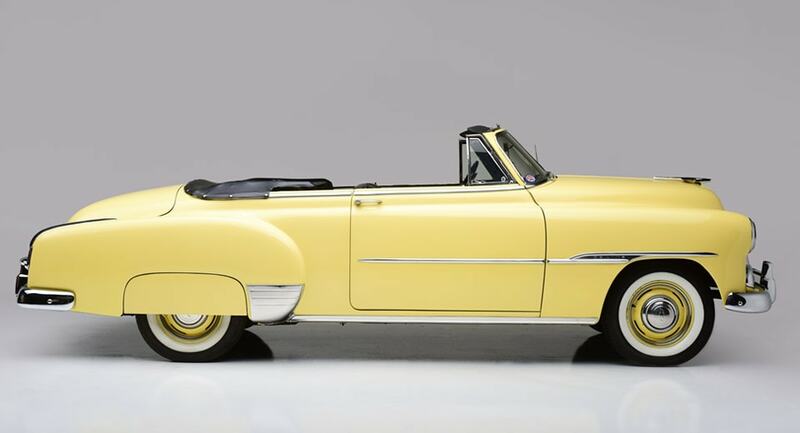 This classic Chevy convertible was just one, and right now it needs a new home. 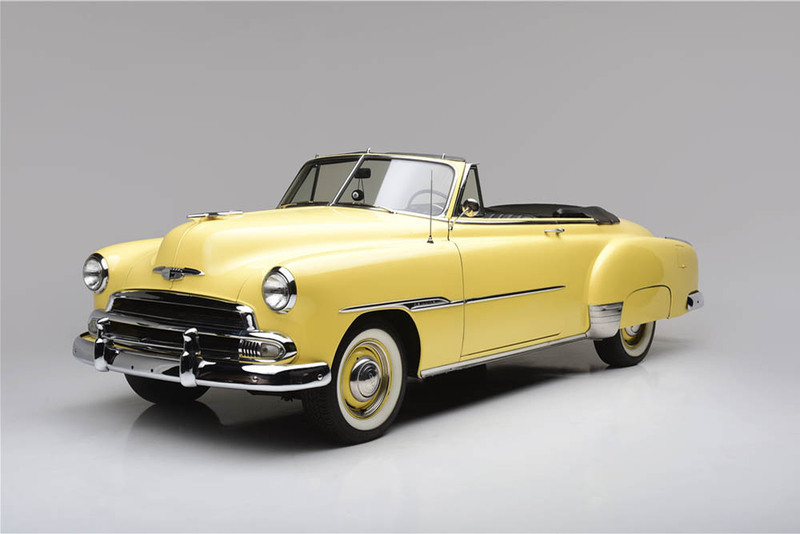 The 1951 Chevrolet Styleline Deluxe Convertible didn’t just belong to the legendary King of Cool – it appeared alongside him (or all around him) in The Hunter, which turned out to be the last movie he ever made. 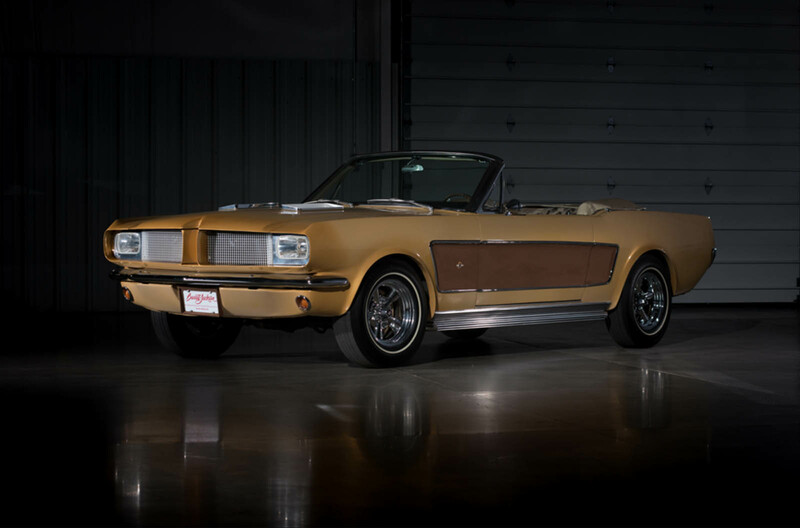 He bought it off the set when filming was done, while its current owner in turn bought it from the late actor’s estate auction in Las Vegas back in 1984, just a few years after his passing. 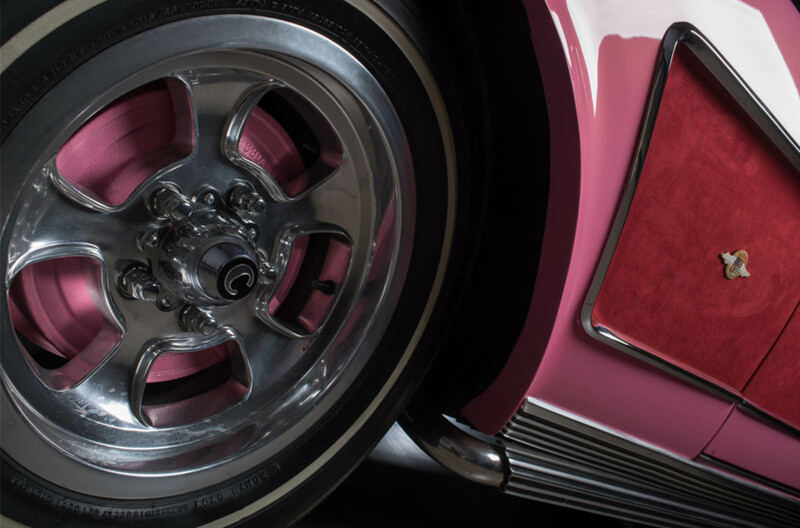 The car was featured in Matt Stone’s 2007 book “McQueen’s Machines: The Cars and Bikes of a Hollywood Icon,” on a two-part episode of Pawn Stars, and comes with a document signed by McQueen’s children Chad and Terry attesting to its authenticity. 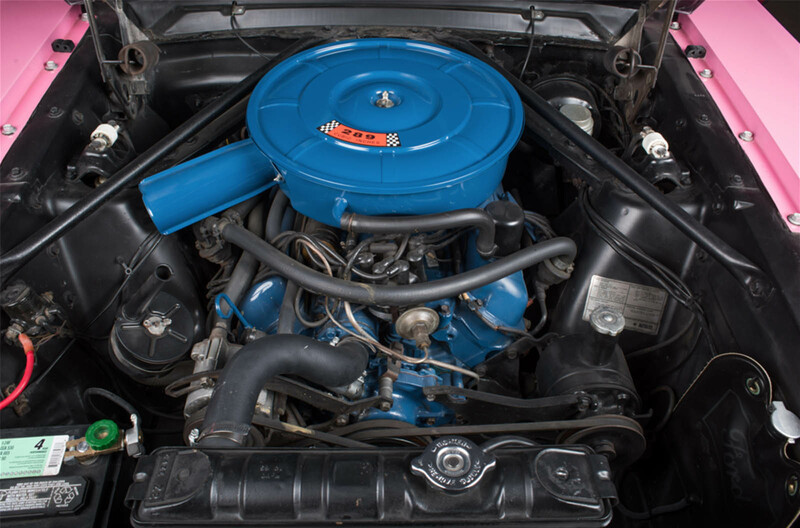 It might not be a racing Porsche or classic Ferrari – heck, its six-cylinder engine only puts out 92 horsepower through a 3-speed manual transmission – but it was McQueen’s all the same, both on and off the set. 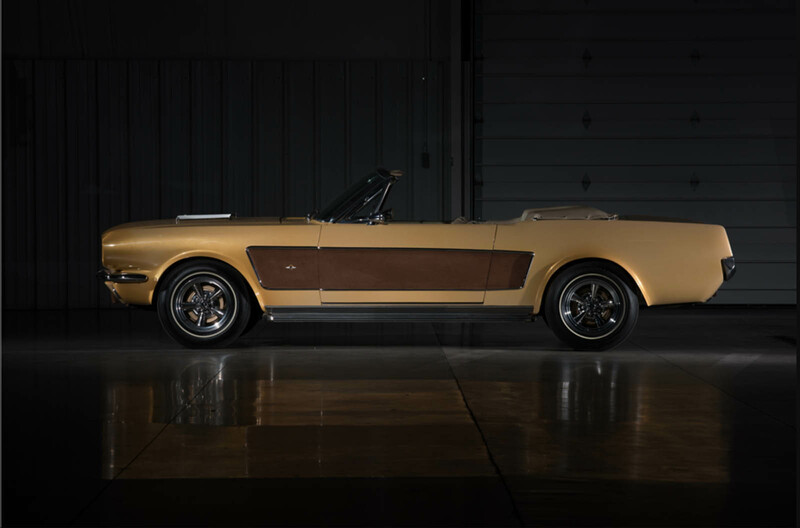 And it could be yours if you place the winning bid at Barrett-Jackson in Scottsdale later this month. Imagine yourself in 1965. You and your significant other are topping the charts and jet-setting around the world to play in front of crowds of fans. 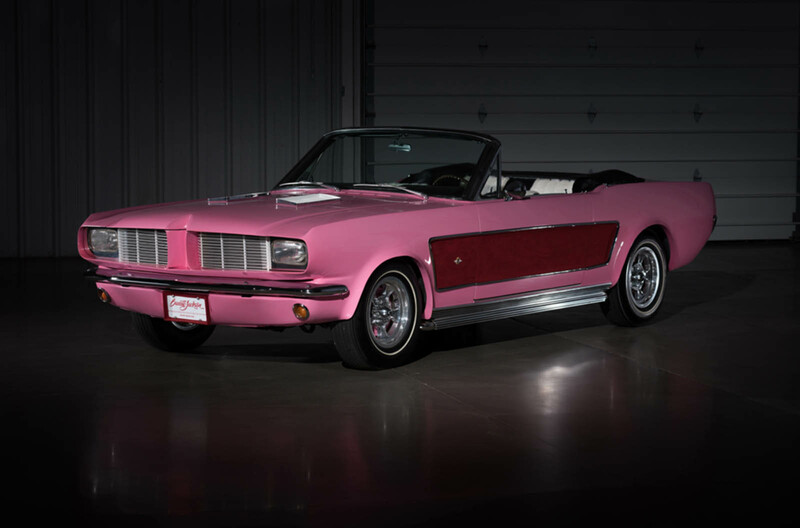 You’re so popular that Ford pulls two new Mustang convertibles off the line and has them customized just for you. 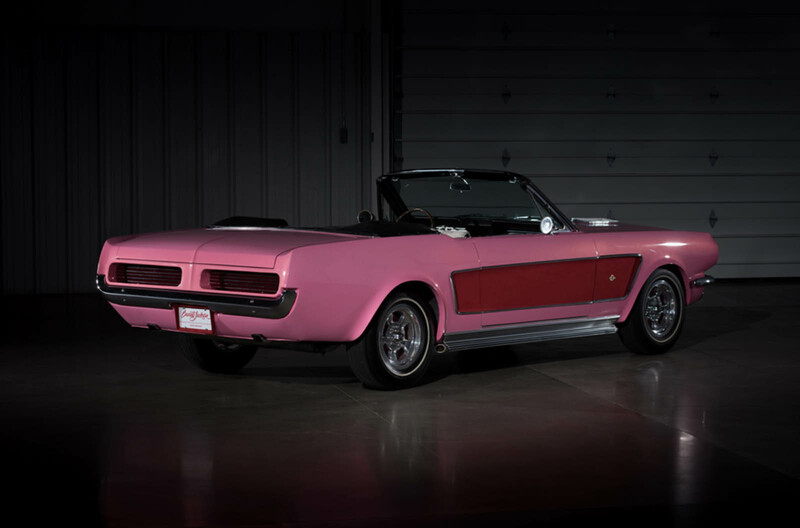 That fantasy was the reality for Sonny & Cher, and half a century later, their custom pony cars are coming up for auction. 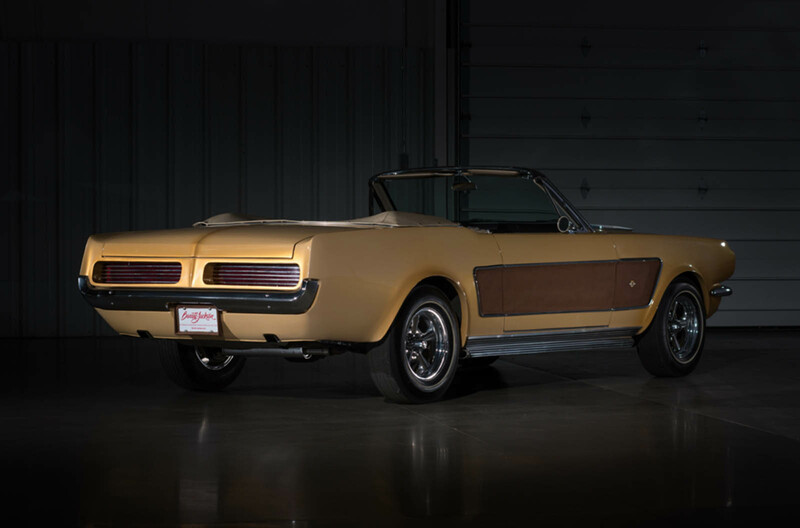 Created at the dawn of the Mustang’s long run, these drop-tops were fitted with 4.7-liter V8s and three-speed automatic transmissions before being modified by the legendary George Barris – the “King of Kustomizers” and Hollywood’s favorite car guy. 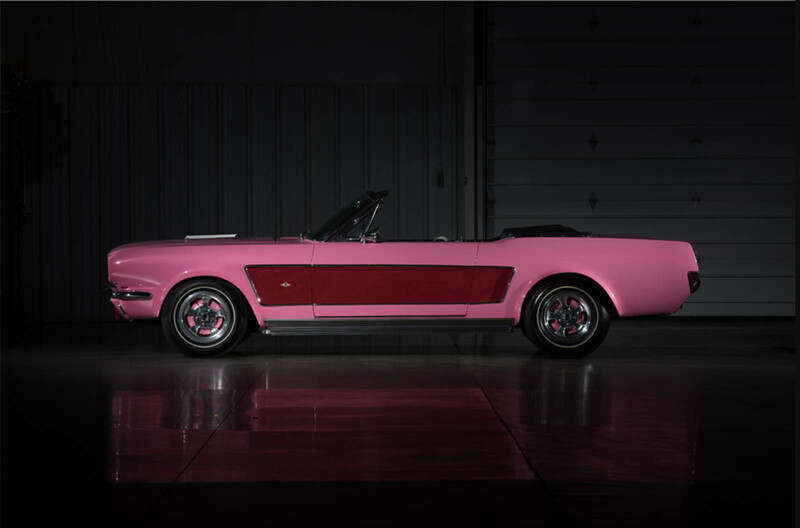 Both received custom paint jobs – Sonny’s in gold, Cher’s in pink – each with 40 layers of lacquer… but that was just the start. 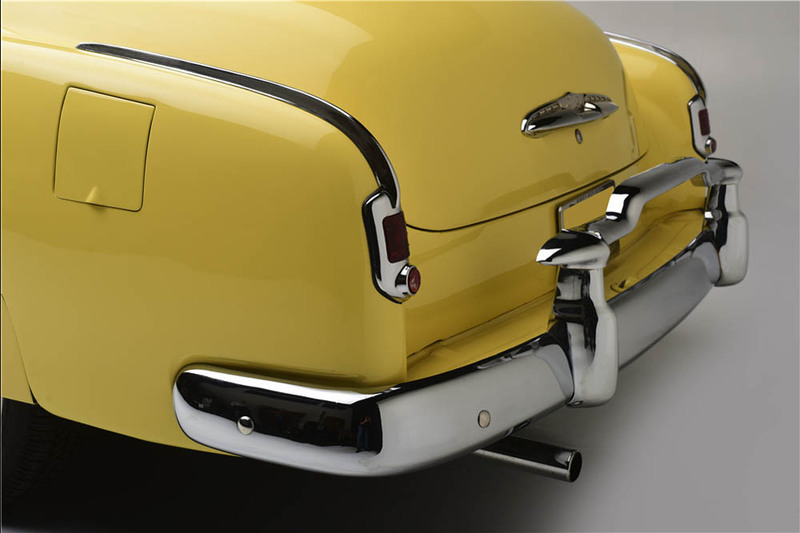 The grilles were new, the taillights fitted from the Thunderbird, the door handles mounted flush, and the wheel arches flared like their new owner’s bell-bottom jeans. Those side panels? Yeah, that’s suede – brown on Sonny’s, red on Cher’s. And that’s before we even climb inside. 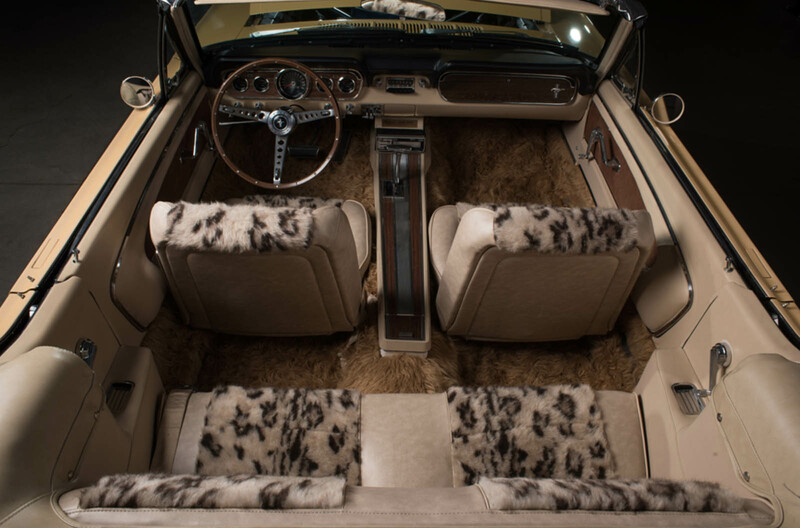 Barris fitted each individually with antique leather and suede with 3-inch fur carpeting. 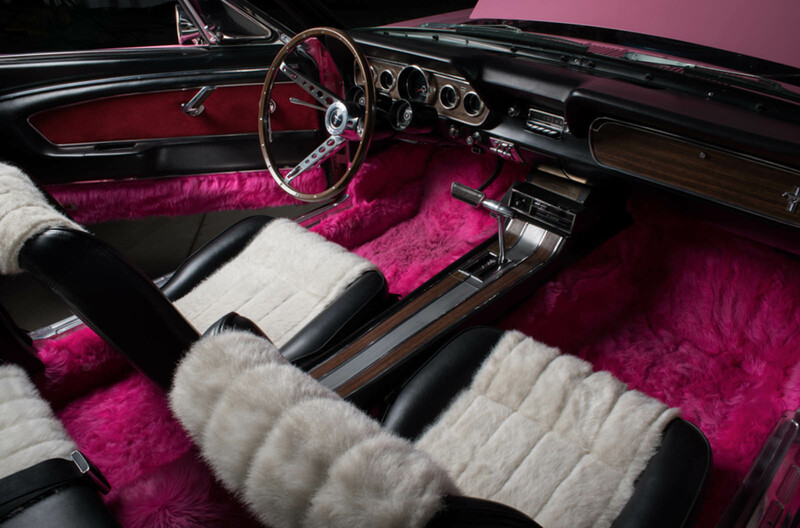 The seats on Sonny’s were upholstered in bobcat fur, Cher’s in ermine, with gold and hot pink trim to match their respective exteriors. For the feint of heart these are not, but they’re splendid examples of the pop culture of the time. 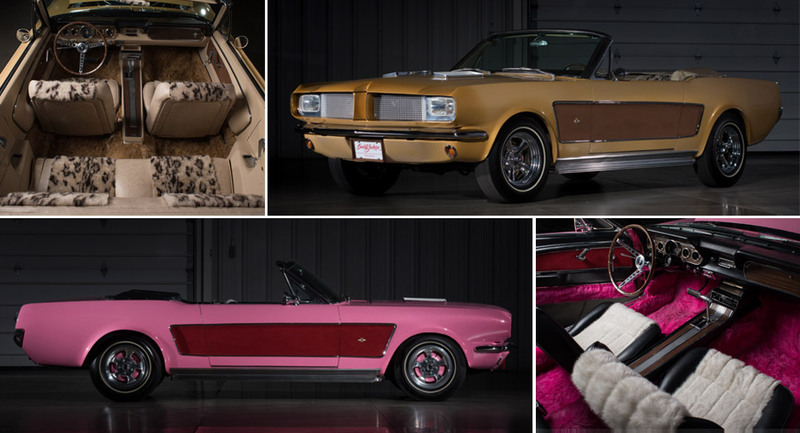 They’ll be sold as a pair, bundled with “an extensive collection of Sonny & Cher memorabilia,” by Barrett-Jackson in Scottsdale this month, where they’re sure to make some collector very nostalgic for a bygone era. In last week’s episode of The Grand Tour, Jeremy Clarkson set out to prove that doing what Ken Block does during his Gymkhana videos is mostly video editing, rather than pure skill. Of course, he was painfully wrong, as proven by the segment he titled Farmkhana: Ultimate_Country_Playground, which consists of a Subaru STI getting thrashed around a farm. The problem is, Clarkson relied mostly on editing to make his drive look epic, which did work to some extent, but all you have to do is pay close attention to a few of the details in order to see everything that’s wrong with the picture. Not only was the show’s host stationary in some of the shots (revving the car while standing still, pressing the pedals chaotically and so on), but he also failed to drift properly through certain obstacles, which is something Ken Block certainly doesn’t need any help with. After the segment itself, you can watch a short “Behind-The-Scenes” video, which will show you exactly what we mean. That STI has probably never felt more helpless. The Grand Tour presenter Richard Hammond is clearly not having a good year, when it comes to supercars. After his notorious Rimac Concept One crash earlier this season, which resulted in him being hospitalized and the $1 million electric hypercar being totally destroyed, Hammond did it again, only this time the victim was a McLaren. 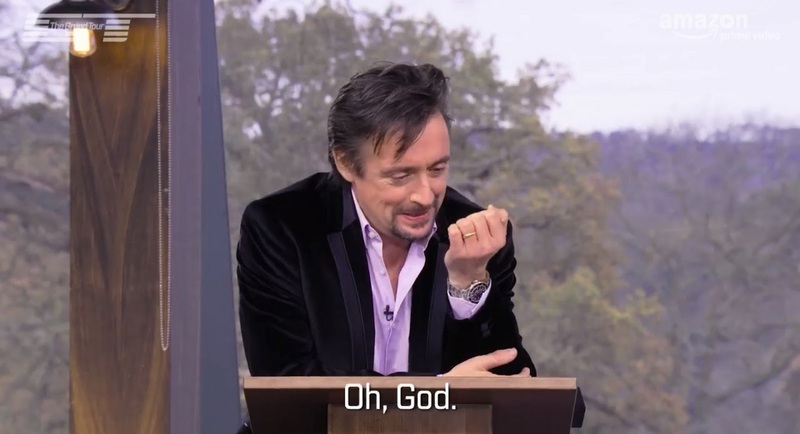 In the latest episode of The Grand Tour, Richard Hammond had to drive two different examples of the McLaren 720s because he broke the first car by filling its fuel tank with water. Hammond said that when the car run low on fuel at the track, he used a nearby jerry can to fill it up again, without noticing that he was adding water instead of actual fuel into the supercar’s tank. 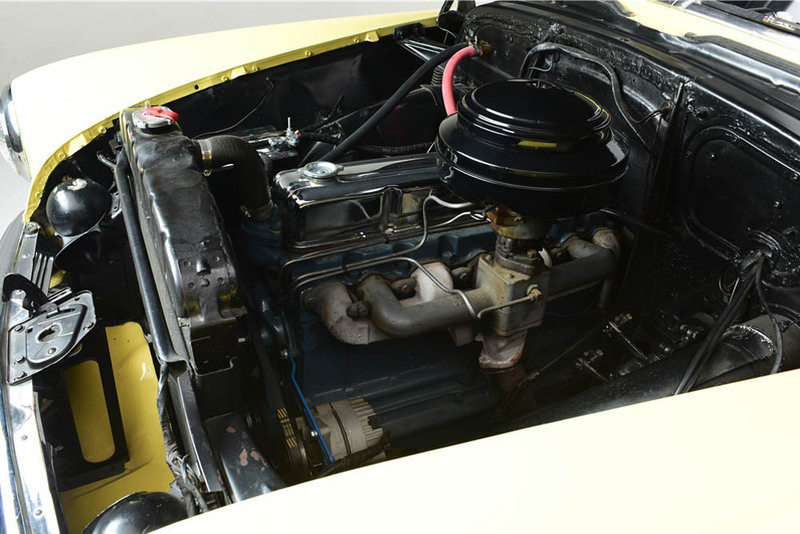 To make matters worse, Hammond didn’t notice of his wrongdoing until it was too late; in his own words: “It was when the engine sort of let go”. At least this time he didn’t had to be hospitalized, which is surely some sort of progress! This week on The Grand Tour: Jeremy gets inspired by Ken Block and wants to do one of those amazing videos, while Richard drives a small tank through a shopping mall, and James tests out a city car. The action-filled trailer starts with Clarkson and an old Subaru Impreza WRX STI rally car, which is thrashed around an English farmland in an attempt to do some Ken Block-ing controlled drifts. In a different continent, in UAE’s Dubai, Hammond sits inside a small tank, which he uses in a luxurious shopping center, before taking it on the Sheikh Mohammad Bin Rashid Boulevard, and on the sand dunes. This part of the show was filmed more than a year ago, and it was initially believed that Jezza was in the driver’s seat. Meanwhile, May takes a trip to the Eboladrome test track to try out the Volkswagen Up! GTI, surrounded by flames and explosions, which he compares to “an 80s action movie”. We also see the facelifted Volkswagen Golf GTI going against its iconic predecessor, the Mk1 Golf GTI. Back in the studio tent, Richard Hammond and James May reveal some behind-the-scenes footage that’s described as “embarrassing”, whereas the Celebrity Face Off shows English comedian, musician, TV and radio presenter Bill Bailey, and English actor Dominic Edward Cooper, in an attempt to find “the world’s fastest person with a failed early career in a band”. Professional athletes tend to have a short career, leaving a long “retirement” to fill. Some move on to team or talent management, but not CJ Wilson. The former All-Star pitcher owns a chain of automotive dealerships. Three of them deal in Mazdas: two in Illinois and one in California. But his dealership in Arizona deals in British supercars, and it’s just added another line. 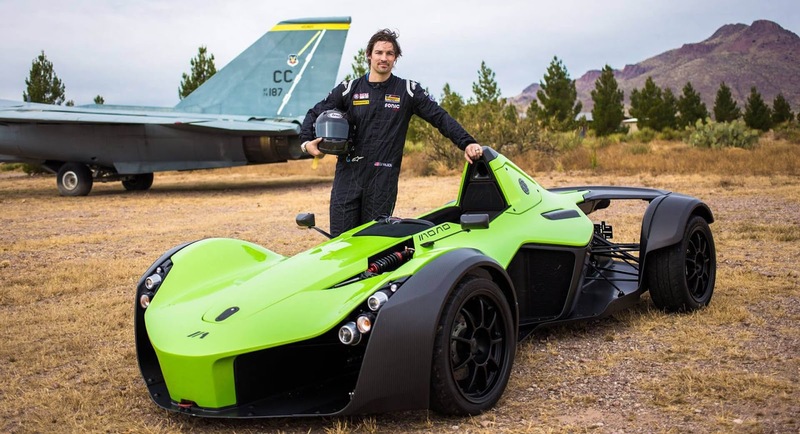 Alongside McLarens, the Scottsdale dealership will now be selling the BAC Mono as well. In fact it will be the first location to receive the updated 2018 model of the single-seat exotic – five of them, to be specific, each of which is available for sale. The left-handed pitcher played for the Texas Rangers from 2005-2011 and for the LA Angels until 2015. 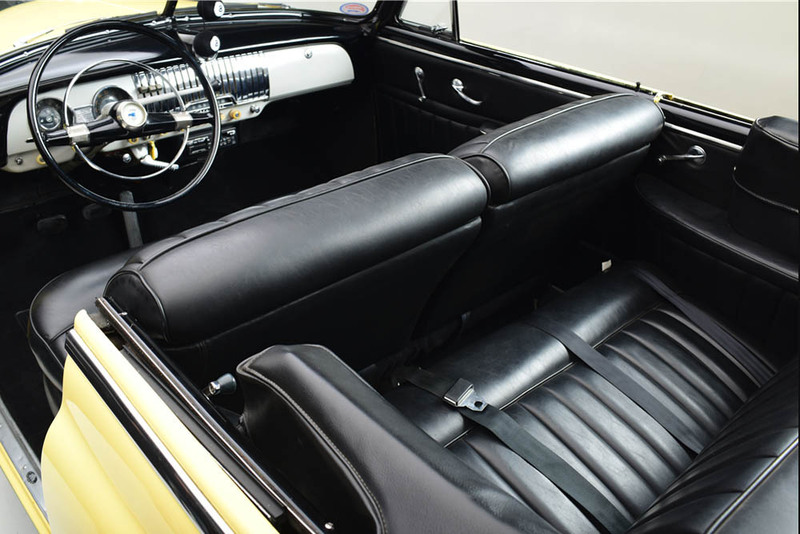 He twice pitched in the MLB All-Star Game, but has since taken to cars. He’s been known to drive Porsches and a custom McLaren P1, and competed in the 25 Hours of Thunderhill and in Mazda MX-5 club races. That’s him driving the Mono at the Inde Motorsports Ranch in the video below. We don’t know about the Mazdas, but if you’re fortunate enough to buy a new McLaren or BAC Mono from his Scottsdale dealership, you just might get a photo or an autograph to go with it. Paris Hilton and pro Golf player Rory Mcllroy will go head-to-head on The Grand Tour’s Celebrity Face Off segment, in February. Both guests will get to drive the Jaguar F-Type, in a bid to see which of them is faster around the show’s new track. The idea behind having Hilton and Mcllroy on, was to see which is the fastest Golfing enthusiast. As for the rest of us, we’ll have to wait until February 8th in order to see which of the two came out on top. Hollywood star Matthew McConaughey is back behind the wheel of a Lincoln, just in time for the NCAA football playoffs. The new ad campaign, dubbed ‘Perfect Rhythm’, will feature two spots starring McConaughey and the 2018 Navigator, this being the first one. 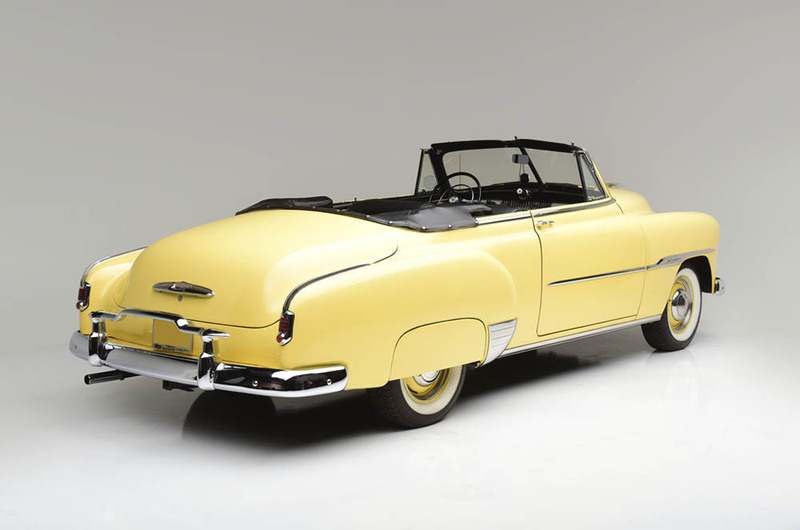 The video was shot in the Pacific Northwest by cinematographer Wally Pfister, who also worked on the “That’s Continental” campaign. The concept was to have McConaughey pull up to a railroad crossing and start an impromptu concert, although no train is in sight. The two-part campaign will air as a TV ad during the January 1st College Football Playoffs, starting with this 60-second video. A second spot will then air later on in the month. Mercedes-AMG is cooperating with Linkin Park, alongside other experts in different fields, to make sure that their upcoming electrified models not only look good and go like stink, but sound the part, too. It’s unknown at this point how the American rock band will help Merc’s Affalterbach-based performance division, but the tie-up was confirmed by AMG chief Tobias Moers, who recently spoke on the topic with WheelsMag. “You know Linkin Park? I started to talk with these guys about what is their interpretation of electrified sound. We’ve had a cooperation with Linkin Park for years. We’re really close”, Moers said. “We started off years ago. We established a team doing artificial sound, and we worked together with games specialists, we worked together with film artists doing sound for films. We sell emotions, and sound is really a crucial part of emotion, so what we do is work on artificial sounds, because you have to”, added the Mercedes-AMG’s head honcho. The Project One hypercar that uses technology derived from Formula 1 is paving the road for Mercedes-AMG’s electrified future. It boasts a 1.6-liter turbocharged V6 and four electric motors that deliver a total combined output in excess of 1,000 horsepower. The first units of the German exotic will arrive in 2019, with production being capped at 275 examples, all of which have been spoken for. Alongside the hypercar, Mercedes-AMG is also said to be prepping an electrified version of the new-gen CLS. Expected to be named the AMG 53, it will slot between the 43 and 63 grades and will, allegedly, combine the 3.0-liter inline-six of the 43 models with an electric motor for a max output of 429hp. We already knew that the Bugatti Chiron would be featured on the next episode of The Grand Tour. What we didn’t know was how Clarkson felt about it. This trailer for tomorrow’s third episode of the show’s second season answers a few questions regarding not just the Chiron segment, but also what Captain Slow’s been up to with the Kia Stinger GT. The two hosts will apparently be racing using a BMW M3 and a Seat Leon Cupra and there will be some sliding around involved, which the M3 is quite good at. Episode 3 is scheduled to air tomorrow on Amazon Prime Video. After driving the new Ford GT for Amazon Prime’s The Grand Tour, Jeremy Clarkson was absolutely astonished by the car’s straight line performance. In the second episode of Season 2, the famous trio found themselves in the US, racing from New York all the way to Niagara Falls. While Clarkson was driving the GT, James May and Richard Hammond had to use public transportation. In case you’ve yet to see the episode, we won’t spoil it for you by revealing who actually won the race. What we will say, though, is that Ford’s supercar car performed really well despite the fact that it wasn’t designed to be a long-distance cruiser. 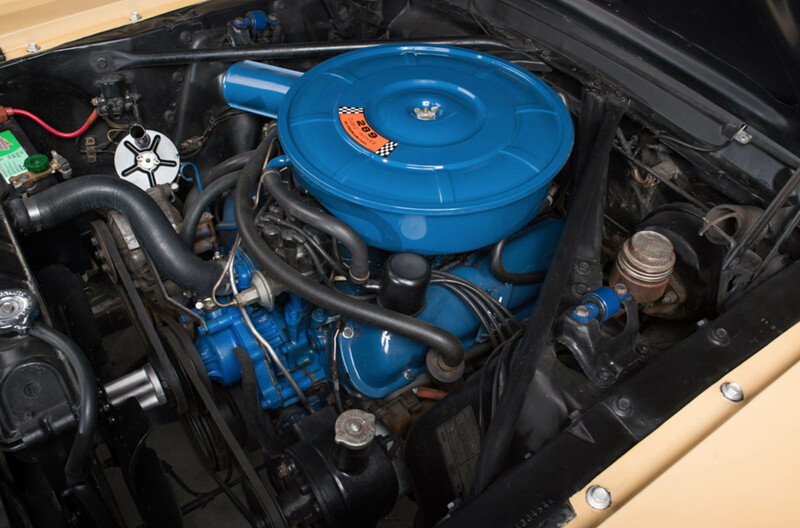 Clarkson also enjoyed the twin-turbocharged V6’s soundtrack and appreciated the fact that there’s no “electronic trickery” to it, although he would have preferred a V8. Even so, with 655 PS (647 HP) and 550 lb-ft (745 Nm) of torque at its disposal, the Ford GT is capable of hitting a top speed of 216 mph (347 km/h), so there’s no questioning its supercar credentials.